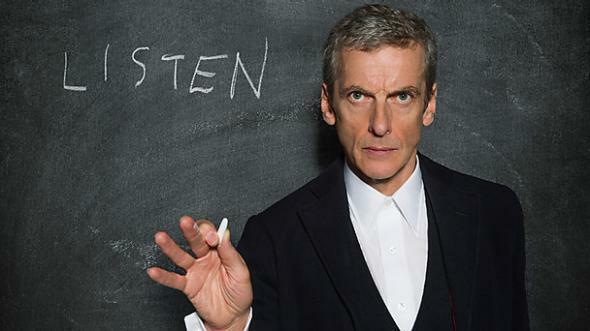 Doctor Who: "Listen" is the best episode in years. Peter Capaldi as the Doctor. No sooner had the most recent Doctor Who episode, “Listen,” finished broadcasting Saturday on BBC1 in the U.K. and BBC America here than many prominent critics, geek sites, and high-profile fans were stepping forward to call it the best episode in years. The members-only forums at Gallifrey Base are notoriously hard to please, but 77 percent of users rated “Listen” 8 or higher (out of 10) in the weekly poll. Even avowed haters of Doctor Who showrunner Steven Moffat, who wrote the episode, were proclaiming it a masterpiece. He picks up on-again-off-again companion Clara Oswald (the increasingly marvelous Jenna Coleman), who’s still smarting from a disastrous date with damaged-veteran-turned-teacher Danny Pink (Samuel Anderson), to test a notion: that the commonly-experienced nightmare about a hand coming out from under your bed and grabbing your ankle is no nightmare at all, but an encounter with one of these perfectly-hidden creatures. The Doctor and Clara’s pursuit of this stealth-monster—which may or may not even exist—takes them backwards and forwards in time, powerfully impacting Danny’s life and culminating in a shocking encounter with the very origins of Doctor Who. But accusing an artist of “repeating himself” isn’t actually a complete argument. Artists repeat themselves all the time. Internet fan-forum scrutiny of Shakespeare’s plays would not have been kind. (“Going back to the girl-dresses-as-a-boy well again?”) The key is in how they repeat themselves. Writers don’t utterly reinvent themselves for each new work. Their toolboxes evolve incrementally over time. At their best, tropes aren’t content, they’re tools, techniques for digging into different ideas. With “Listen,” Moffat deployed his bag of tricks to devise one of the most innovative Doctor Who stories ever, one that breaks new ground both structurally and thematically. Unlike virtually every other story in the series’ history, in this one there may be no real problem to solve, no alien menace, no despotic dystopia. Every situation we see—including the stunning bedspread and farmhouse sequences, both instant classics—is brought about by the Doctor reacting to no clear problem at all. Indeed, every peril-trope depicted in “Listen” may have only come about through the Doctor’s needless instigation. Which leads into the greatest element of “Listen,” what truly sets it apart as a landmark story: Moffat uses these tropes to powerfully reconsider Doctor Who’s contract with children. Indeed, it’s hard to properly understand “Listen” without thinking about it in the context of Doctor Who as a children’s program. As recurring cast member Alex Kingston has pointed out, the biggest difference between U.K. and U.S. fandom is that a significant portion of the former is made up of children, many of whom are frightened—and then emboldened—by watching Doctor Who. The monsters appear, and they’re scary, but then the Doctor appears, tells a joke, and outwits them. Many children’s earliest experiences of fear are irrational ones—monsters in the dark, in the closet, outside the window, under the bed. And because these monsters can’t be seen or defeated, and because your parents don’t believe you, these fears can instill a potent sense of powerlessness. So often children define the kind of adults they want to become in reaction to this powerlessness. This is what Moffat is digging into here: Because we see Danny at different points in his life, we see how he defines his adulthood in response to his childhood fear. He becomes a soldier, the strongest thing he can think of to be … except that now he’s broken and closed-off as a result. With the climactic revelation that the Doctor too was a frightened child once upon a time, we can see this same process at work in our hero as well. He’s reacted by becoming DOCTOR WHO, the larger-than-life hero who strides the cosmos laughing at fear. But this strategy has its limits too, as we see in the paranoia that’s overtaken him at the beginning of the episode.